What kind of country commits acts of terror and frames an innocent 21-year-old man who cannot defend himself because he has been drugged? The US is satanically possessed by the same insidious force behind Communism. As the jury deliberates today, certainly Dzhokhar Tsarnaev’s will be sentenced to death or life imprisonment. His “trial” has been a farce. His lawyer pled him guilty and did not mount a defense. After the Prosecution took 15 days, the “Defense” took six hours. It ignored evidence that Tsarnaev was carrying a white backpack. A Craft International agent carried the black backpack containing the bomb. The accused has been without friends in the court. The appointed public defenders have had one goal — to protect the government’s false accusations from exposure. Lead Prosecutor William D. Weinreb has submitted false evidence, knowing the public defenders would not challenge him. Weinreb told the Jury that the bombing was Muslim revenge for US foreign policy. Illuminati Jews like Weinreb have been prominent in perpetrating false flags on Americans to justify the creation of a police state. 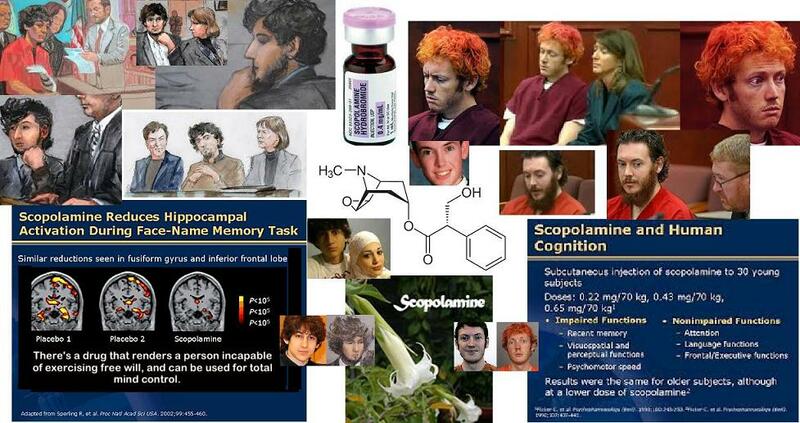 Scopolomine was used to control James Holmes and likely it is being used to control Dzhokhar Tsarnaev. The drug incapacitates the victim, rendering him docile and child-like, without even a memory of what occurred. Dzhokhar has no “friends” to see him up close, to talk to him, to detect if his behavior is not being controlled through psycho-pharmacology. He is kept from other prisoners and is not allowed to speak to his family. Earlier he protested his innocence, yet he did not react when the public defender, Judy Clarke, said in her opening remarks, “He did it.” Nor did he make any comments to defense counsel when the prosecution was making its case.